Dream Create Inspire: Happy Birthday Katie! It's Paper Makeup Stamp's owner extraordinaire Katie Cotton's birthday today!! The Paper Makeup Stamps DT have joined together with PMS vendors for a surprise birthday hop for Katie! You can get a complete list of hop participants and start the hop at the Paper Makeup Stamps blog here! I didn't get a chance to prepare a new card this week because my little Alexandra had the flu this week and kept me pretty busy! 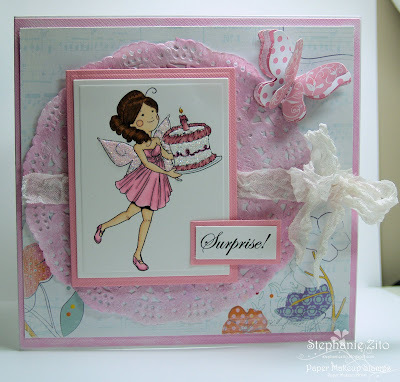 I'm sharing a birthday card I prepared not too long ago using the adorable Natalie Birthday Fairy! Natalie was previously released only in digital format but after many requests, she is now available in rubber as well! I'm also using the "Surprise " sentiment which was free with any new May release purchase! Hope you have a wonderful day Katie! Very pretty card Steph! The doily in the background gives it such a soft feel to it and I really like the ruffled ribbon. I hope Alexandria is feeling better!! This is gorgeous!! Love the pink doily and the coloring is fabulous! Beautiful card, Stephanie and very worthy of being shown again! :) Hope your daughter is feeling better now too! What a beautiful card, Stephanie! That image and sentiment are perfect! such a sweet card! I love love love the butterfly add on! I can tell you've been in PINK mode! Thank yoU!